Lately, there’s been a demand to fix the drama that has been going on over the past few years at New York fashion week. Oscar de la Renta was amongst the first to make news by cutting off half of people who made no sense in attending his show. The reason you invite press is so they can expose you in some shape or form. If not, why attend? Makes sense to me. Diane von Furstenberg and Michael Kors were also two of the latest stars who left the prestigious Lincoln Center to present their fall collections elsewhere. Ouch! And it seems after this, the attempt to fix the chaos may be beginning to take effect. There’s more space at the Pavilion. No difference at the Salon. Well, from your computer screen you could probably suggest it doesn’t look overly crowded. The point is it still needs some major renovations. The day began with a soothing collection at Nicholas K. It is no surprise designers, Nicholas and Christopher Kunz, would send out a series of asymmetric and draped pieces again. The duo simply lives for these cuts. But they are so passionate about these designs, that it can sometimes be confusing to understand. At least the way they style things together. Taking apart some of the looks, you could find intricate denim jackets with fur-trimmed collars I thought were pleasing for such construction – light and edgy. A detailed, chunky burgundy cardigan that looked practical with some sweatpants. 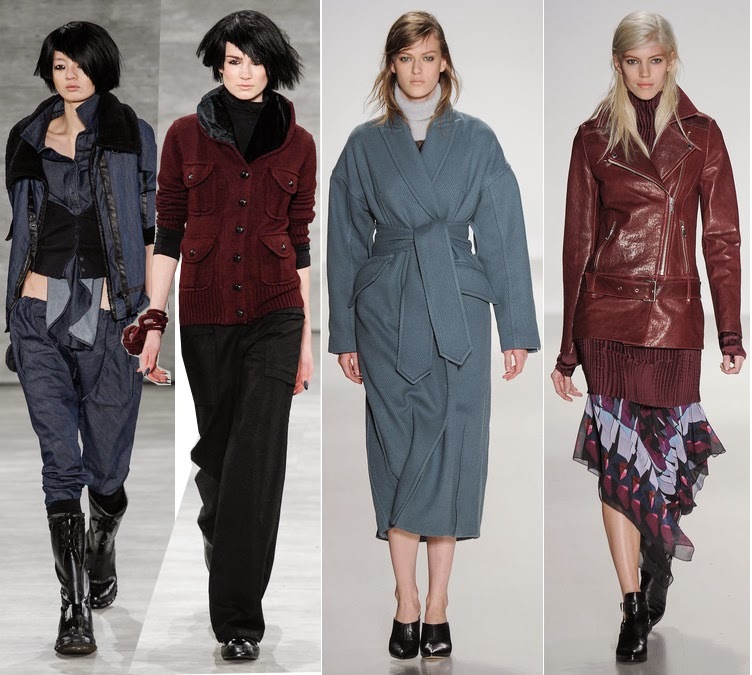 And more of those repetitive asymmetrical jackets that have become the protagonist of the brand. Not that its bad, but sometimes you need fresh ideas like those denim numbers to keep things relative. Relative were their glossy boots that made you want to order some for this snow storm that has been said to hit this week. Colors were centered upon neutral grays, black, brown, and burgundy. In general, it wasn’t a perfect collection, but neither the most tedious. Just the right amount of energy to fuel for the next one. Richard Chai probably has to be proud with how his label has grown to be a place where celebrities like Colton Haynes, Joe Jonas, and others gather to see his show. It never hurts to have someone famous at your presentation, and when you do, it should always be that time to deliver the best you’ve got. Mr. Chai understands that clearly. Mr. Chai has always had a great sense of tailoring that are noticeable in his clothes to begin with. For example, his new slim-fitted pants and suit jackets that came in metallic, color-block, and luxe floral patterns. But his biggest support has to be his enticing outerwear pieces that hit a high note at his new fall 2014 collection. 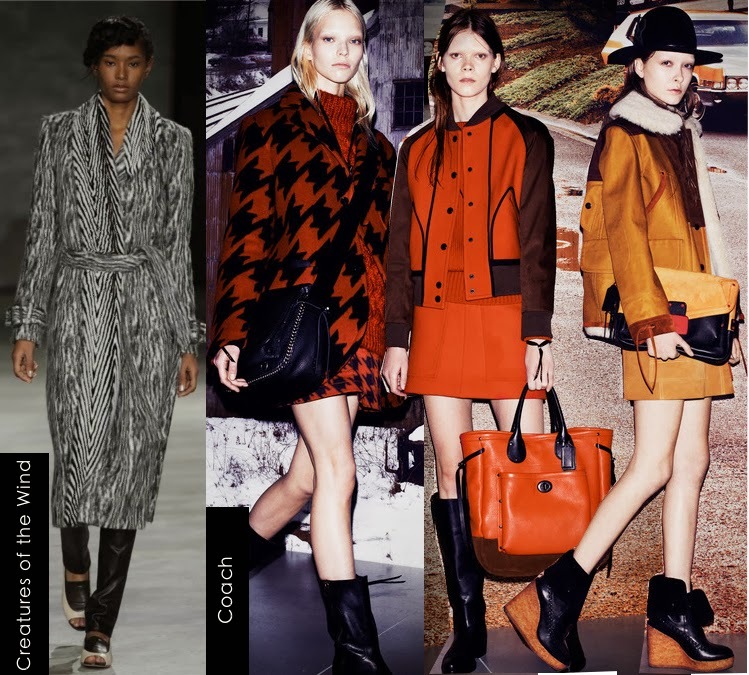 There were plenty of outerwear pieces to crave for next season: oversized wrapped coats in plaid, camel, and powder blue; a burgundy floral patterned trench coat; and sumptuous leather jackets with shearling collars and gloss effects in marketable colors – wine, dusty gray, and black. His menswear clothes were by far his most powerful of all here – sharp, tailored, and youthful. No wonder why his male clientele is growing. So is his female customer who wouldn’t look bad borrowing her boyfriend’s jacket either. The brand has the word Love in it after all (if you understand). Meanwhile, it is Coach we should talk about. The label has already become a successful billion dollar accessories house women demand for. There’s no questioning that there’s not a single woman who doesn’t own a Coach purse or shoes in the world. The real question here though is, does a label as prestigious as this one need apparel to be the next fashion house? Tod’s was the first label that came to mind when trying to prove some of my thoughts, but then again Tod’s may be a famous luxury accessories house among the rich that feels appropriate to implement apparel; it’s first debut was almost perfection. But why not billionaire Coach? Coach is luxury as well. And for this reason they hired British designer, Stuart Vevers (who was replaced by Reed Krakoff – the one who placed Coach where it is now), to create its first ever ready-to-wear collection for the label. Was it a smart move? Absolutely! To summarize it a nutshell, Mr. Vevers offered luxurious, practical, and youthful clothes in terrific colors that will speak to everyone come next fall – fuschia, saffron, camel, baby blue, and navy. Outerwear in particular shined: a compelling, oversized red-and-black houndstooth coat was worth an eye for; cheerful knitted sweaters with stars and rockets; toggled and shearling collared coats; and sleek textured leather jackets. Accessories in general: chic fancy and shearling hats, gloves, bags, and wedge-boots. Keeping Coach updated doesn’t seem to be a problem to worry about for Vevers nor its investors. While some of the looks designers, Christopher Peters and Shane Gabier, of Creatures of the Wind transmitted heaviness in proportions, there were some that were as effortless and luxuriously elegant as throwing on a beautiful multi-patterned fur wrap coat, a navy wrapped cardigan worn with a green metallic skirt, or a black long-sleeve shirt tucked under a navy striped skirt young women would appeal to. There's work to be done in some of those nostalgic prints that can offset their skills at the label. A nice Jacquard cropped jacket was fresh. Still, there are great pieces to invest in. Mature or young as the market is demanding.